Teach rural and urban students of Class VI, VII and VIII to read English with comprehension, write without errors and speak fluently. Why have Classes VI, VII and VIII been chosen? No proper English coaching takes place at primary level. At the middle level, the students of Class VI, VII and VIII are unable to cope up with the syllabus of English lessons. They are worried how to meet the challenge in upper Classes. If they do not do well in English, the tendency would be to drop out. A random survey was conducted among Class VIII students in 27 Govt. (AIDED) schools of four districts of Tamil Nadu. A diagnostic test paper with basic questions was given to children to answer in 15 minutes. The following is the finding. To reach a manageable level in using English, one has to score more than 70 percentage points. Even if we consider those who have scored 50 and above as adequate, the above table shows that 96 percent of the students are far below the average level. Students of Standard STD VI, VII and VIII may have learnt a few words in English but they do not know how to use them. They will be given intensive training systematically to speak English fluently to read, speak and write. The course has been designed to be completed in 32 sessions of 2 hours each spread over 4 months. A team of two trained tutors will handle one batch of 30 - 40 students. Group activities are adopted to learn conversing in English and the students enjoy the sessions. The planning started in September 2008. Gradually many Vidyarambam tutors have been given training and finally after 5 years about 30 Master Trainers are in the field taking the challenge. These Master Trainers will train about 300 tutors who will in turn coach 2250 -3000 students in 4 months. It is likely in the 2nd phase of the program same amount of students can be coached. So in a year, we expect to support 4500 - 6000 students in ELE program. What is the response of the school management? You will get a periodical feedback about the progress of the beneficiary with photographs. I wish to Sponsor this program. 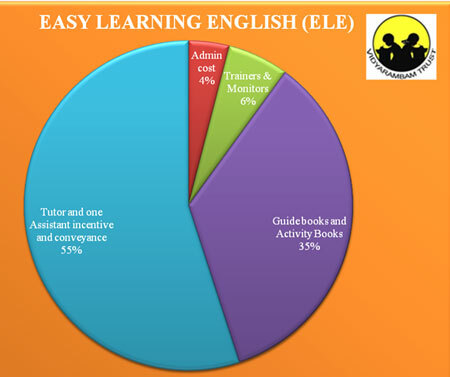 Easy Learning English (ELE) program for 30-40 students.